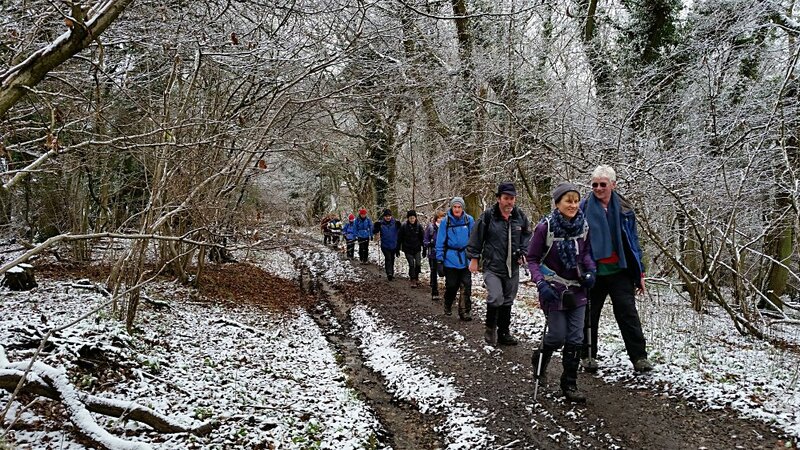 On Saturday 9th January after our initial challenge of the railway barrier being stuck down with the walk start on the other side of the barrier, eight of us headed off on a circular walk from the Rowbarge Inn in Woolhampton. Perhaps numbers were reduced due to the poor weather forecast, if that was the case it was a shame since we only had a short shower – there appears to have been a spate of winter rain predictions this year that have been inaccurate! We first set off east for a couple of miles of the Kennet Canal to Aldermaston Wharf, the canal stretches 87 miles from Bristol to the Thames at Reading and the stretch covered is regarded by the leaders who have walked the whole length as average pleasant. The wharf is an appropriate name since the spot always appears to be busy with some permanent moorings. In lieu or visiting the canal trust tea room which may well have been closed a drink stop was had by the lock with Stollen cake handed out by the leaders. From Aldermaston wharf we next headed north, carefully crossed the fast moving traffic on the A4 and headed for Beenham via road passing a small industrial area and Shrub wood up to the remote St. Mary's church at Beenham. From the church we went west down a slippery slope into Old Copse towards Oakwood farm and then again north to the outskirts of the main village of Beenham. A brief stop was taken with much talk about green telecomms boxes (there will not be a picture of this!) before heading west into High Wood and south to Douai Abbey. Lunch was taken next by the tennis courts with some reasonable play in progress. 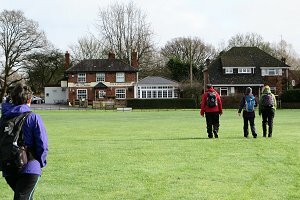 After lunch we headed past the Elstree School in Upper Woolhampton, west to Channel wood, Midgham Green and across the scenic Midgham Park. After the recent rainfall the leaders were expecting to have to cross a river within the park but it appears despite seeing from a copse the source of a flowing ground spring the land owners must have carried out some drainage work to divert the flow underground. Most of us stopped at the Rowbarge for a drink before heading home. The Rowbarge provides a limited number of car park spaces for walkers so it was the least we could do after the walk! Thank you to Mike for the write-up. Sorry there are no pictures of this walk. Stopping to look at the remains of St. James's Church at Bix Bottom. On Sunday 17th January, twelve of us met up in Middle Assendon, surrounded by a light sprinkling of snow. 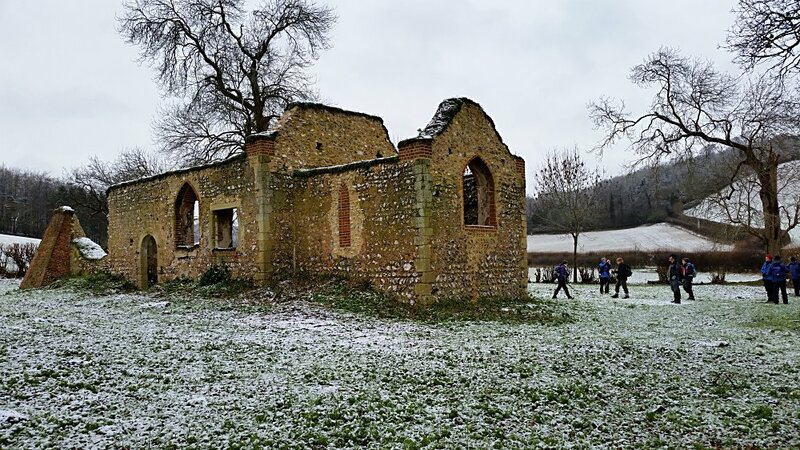 Although the sky was rather grey, the Chiltern Hills looked rather nice, dusted with white. 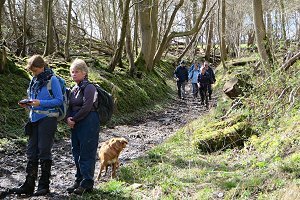 Setting off from Middle Assendon, we followed Rectory Lane to Bix Bottom, where we stopped off to look at the remains of the Saxon church of St James. Then we began our first hill, following the Oxfordshire Way up through Freedom Wood to Maidensgrove Scrubs. The higher we got, the thicker the snow and more picturesque it became. Walking through Maidensgrove Scrubs, near the Warburg Nature Reserve. After passing through Lodge Farm, we made a slight navigational error and began following the Chiltern Way instead of the Oxfordshire Way. This led us into Park Wood, which looked quite beautiful with the snow, but following this route would have bypassed a large part of the walk, so we doubled back and re-joined our planned route. Now following a much muddier route, we made our way through Maidensgrove and downhill through Pishillbury Wood. Uphill again to Pishill House and then downhill once more, past Pishill's Norman church. 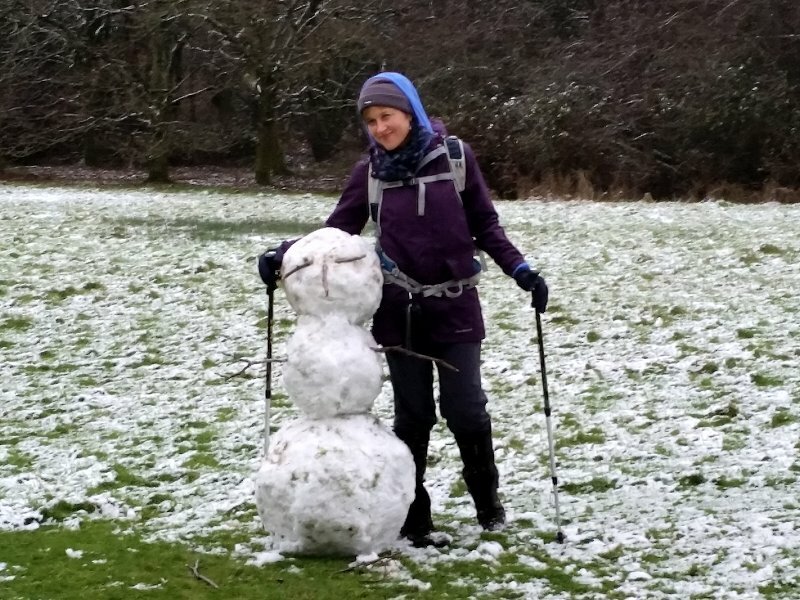 Julia, our walk leader, posing by a snowman we found in Southend. Leaving the Oxfordshire Way we headed east along an undulating footpath to Turville Heath, stopping off at a high point to have our picnic lunch. Heading south through Summer Heath (looking very wintery) and then Southend, where we saw our second snowman of the day, we joined Shakespeare's Way, which we followed through Stonor Park. The long and gentle descent through the park was inevitably followed by a very steep uphill slog to Coxlease Farm. Finally we made a gentle descent, via Paradise Wood, back to Middle Assendon. See our route on Bing Maps. My GPS reckons we did 670m (2200ft) of ascent in total, but my legs feel like we did even more, what with all the slippery mud on the paths. Still, we should have burned off a few mince pies! 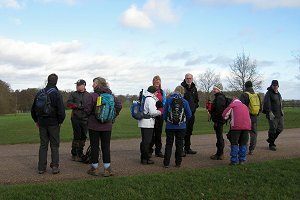 On Sunday 31st January, fourteen of us met up in the rain at Okwells Park in Cox Green. Despite the inauspicious start, the rain cleared up within an hour of starting the walk. It remained wet underfoot, of course. 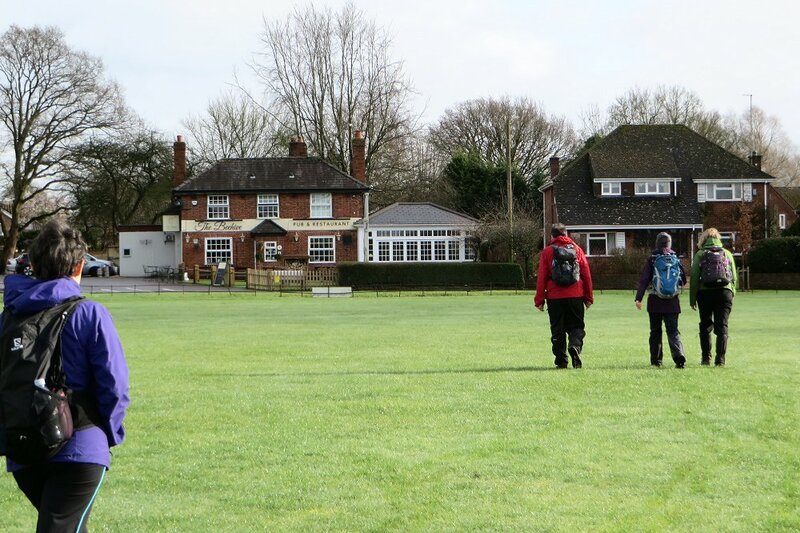 The walk started by following some quiet roads that took us westward to the edge of Cox Green, where we joined a footpath taking us past the edges of Woolley Green and Littlewick Green. Turning south, we crossed fields, a railway line and Shottesbrooke Farm on our way to Shottesbrooke Park. After a quick look at the church, we stopped by the pond to have our packed lunches. Crossing the sports ground, heading to the pub. After lunch we followed a footpath heading eastward to White Waltham. As we entered the village and crossed the playing fields, The Beehive pub hove into view. We stopped here for a drink before continuing eastward, through White Waltham and heading north after looping around Waltham Place. 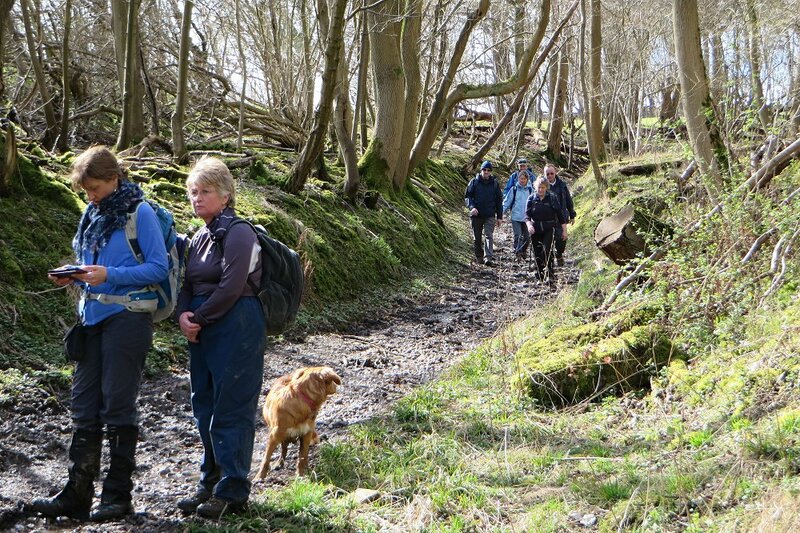 The remainder of the route included fields, woodland, farmland and plenty of muddy paths. We arrived back in Cox Green by way of Lillibrooke Manor. 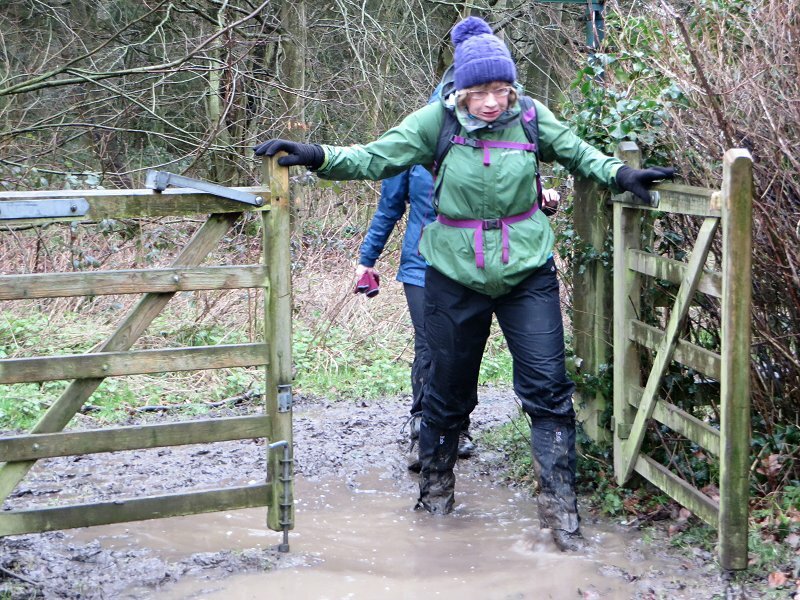 This was an alteration to the original route that the leader chose to take on account of the seriously muddy paths found during the pre-walk done a week earlier. Once in Cox Green, we followed the road back to Ockwells Park, where we had started. See our route on Bing Maps. It's a bit windy in Windsor Great Park. On Sunday 7th February, we attracted 18 walkers including Ann and myself [Kathy] plus 1 Labrador - pretty good considering the unsettled weather the day before. We were able to enjoy a dry day, some sunshine and only one short track with mud. From Cranbourne Gate on tarmac paths we headed round the back of the village, past Prince Consort Workshops then turned up Dukes Lane adjacent to Queen Anne's Walk. At the top were excellent views down to Windsor Castle. 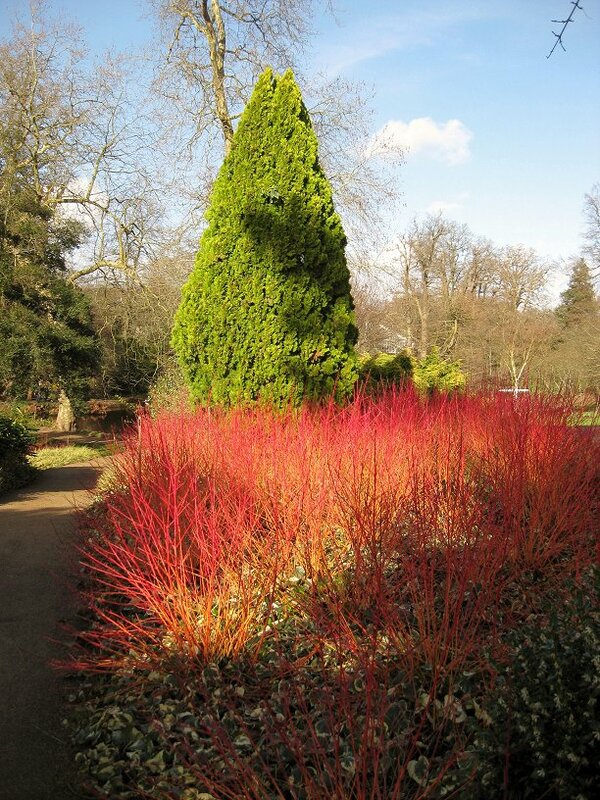 Some winter colours in the Savill Gardens. From there, taking a bridal path through woods and lakeside, negotiating muddy tracks we emerged into Virginia Waters, and on good paths to Smith's Lawn passing the Polo Ground and Prince Consort's statue. We arrived shortly after at Savill Gardens for extended lunch-stop allowing time for refreshment at the café, visit the shop, WC facilities and walk round the gardens, which are free until end of February with much to see with some striking colour bushes and early spring blooms. Following our break we walked on to Bishopsgate and the deer park. Nearby the gates we were rewarded by a number of majestic stags who posed happily for us. 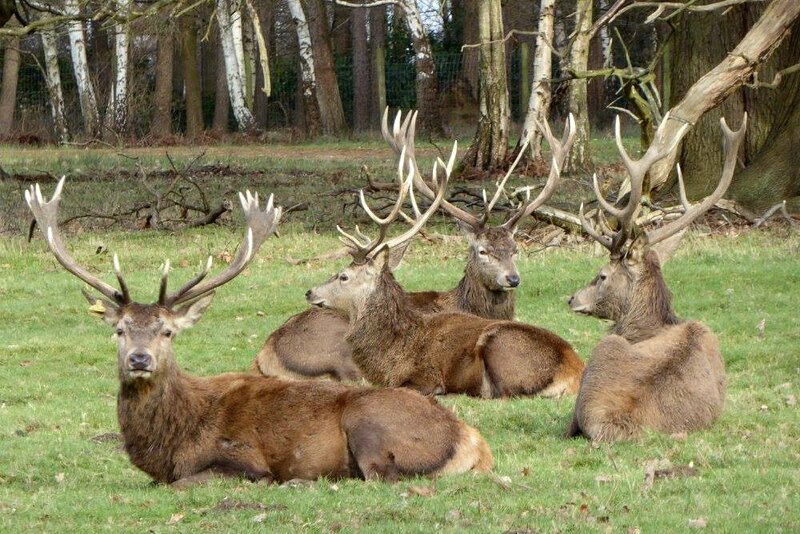 Some stags in the deer park by Bishop's Gate. We then passed the Copper Horse statue which also affords the best views down the Long Walk to the Castle and also saw some more deer and a large hare racing along the adjacent field. Our last stop was back in the village where at the Royal Post Office several of us enjoyed a welcome warm drink (whilst Greg & Ann had ice-creams!) in the garden before returning back to the car park. 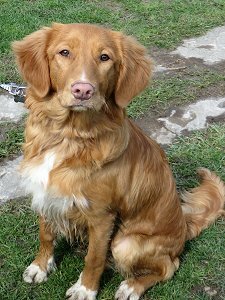 Thank you to Kathy for providing this write-up and the photos. Walking through Burnett's Wood on our way to Aldworth. 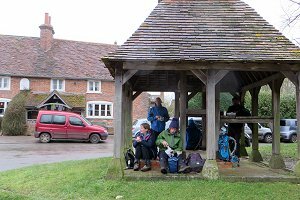 Ten of us, including one newcomer trying us out, turned up on Saturday 20th February in Yattendon for a ten mile circular walk to Aldworth and back. Although it hadn't started raining yet, the forecast was for heavy rain from lunchtime onward, so our walk leaders (Mike and Alison) were proposing a "plan-B" to shorten the walk if the weather got too bad. We set off, heading west and then north, through fields and farmland with dark clouds looming over us. 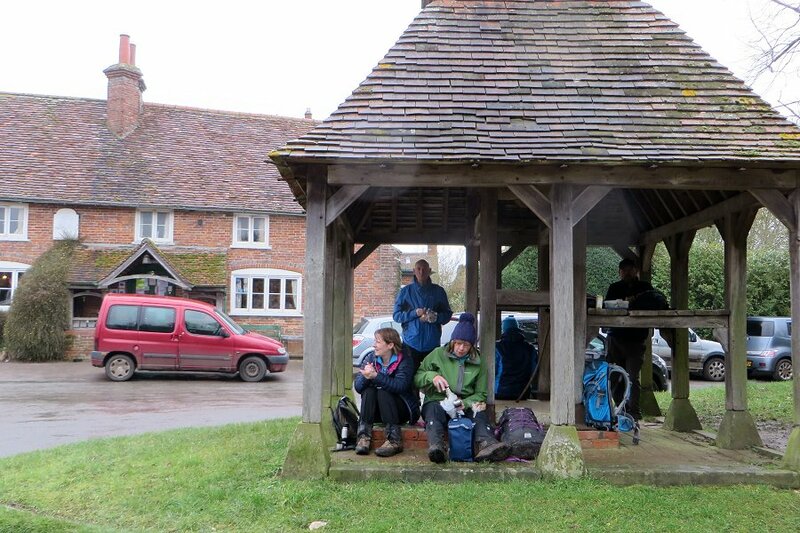 Eating our packed lunches by the old well in Aldworth. We made it as far as Ashampstead (about half way to Aldworth) before the rain started, but even then it wasn't heavy, so after a short discussion we reverted to the original planned route. Continuing north, we passed through woodland and fields, along many waterlogged and muddy paths. Eventually we reached Parsonage Green, and passing through, we arrived at the village of Aldworth. Just opposite the pub there is an old well with a tiled roof. This made a good shelter for us to stop for our picnic lunch before popping in to the delightfully quaint Bell Inn for a quick drink. Wading through a gate into the church yard at Yattendon. 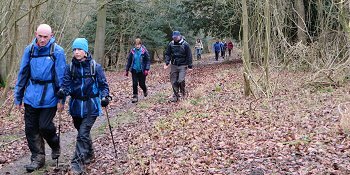 Continuing the walk, we left Aldworth heading east to Hungrerford Green and then turning south on our winding journey back. This involved many muddy paths, testing our boots and our balance. Our newcomer asked if people ever fell over in the mud. Mike and I joked that it was traditional for newbies to slip over on their first walk. It wasn't too long after saying this when it came true. Both Mike and I felt rather guilty, as if we'd tempted fate! Sorry! Anyway, she wasn't hurt and the walk continued, finishing with back at Yattendon at around 3pm. The rain hadn't got too heavy but it had been quite windy throughout most of the walk. See our route on Bing Maps. Leaving Hatchet Wood and crossing Shogmoor. 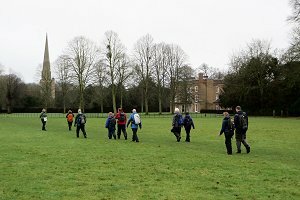 On Easter Monday 28th March, ten walkers and a dog gathered at Hambleden, despite the weather forecast. The previous night, Storm Katie had made her presence felt and more was predicted for today. As it turned out, we didn't see a drop of rain until after the walk had finished, and it was only windy in high, open areas. Leaving Hambleden we walked up the valley through fields to the edge of Skirmet before heading uphill through Hatchet Wood to Hill's Wood. We then left the shelter of the woodland for a breezy open field before descending slightly to Little Frieth. Megan, the Nova Scotia Duck Tolling Retriever. 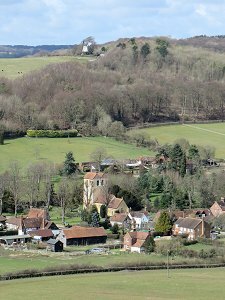 From there we headed up to Fingest Wood, where we stopped for our picnic lunch at the top of a hill overlooking the village of Fingest and with a view of the windmill atop Turville Hill. The view of Fingest from our picnic spot. 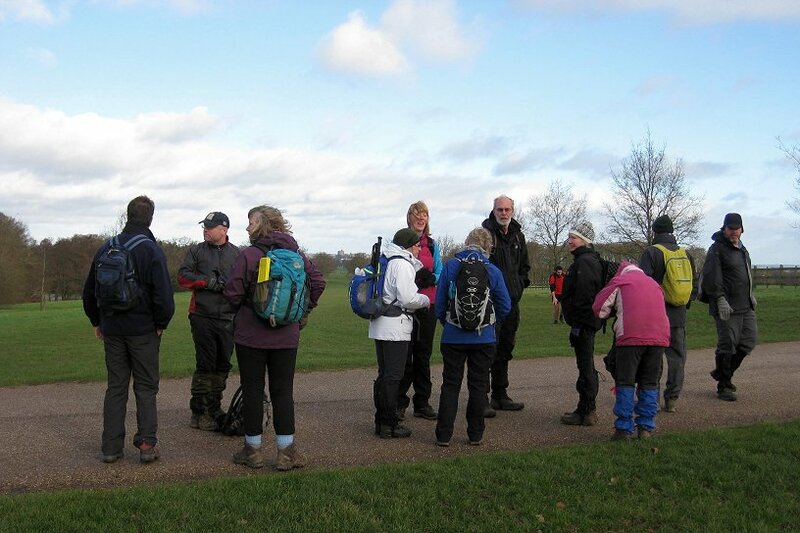 Once the picnic was over, the walk leader handed out some chocolate Easter treats to each of us. This was both unexpected and welcome. Then we descended into Fingest and made our way to the Chequers Inn for a drink. Suitably refreshed we walked and slid along a very muddy path that led us partway up Turville Hill, then back down into the picturesque village of Turville. Along the way was more evidence of the previous night's storm - fallen trees and a broken telephone cable. 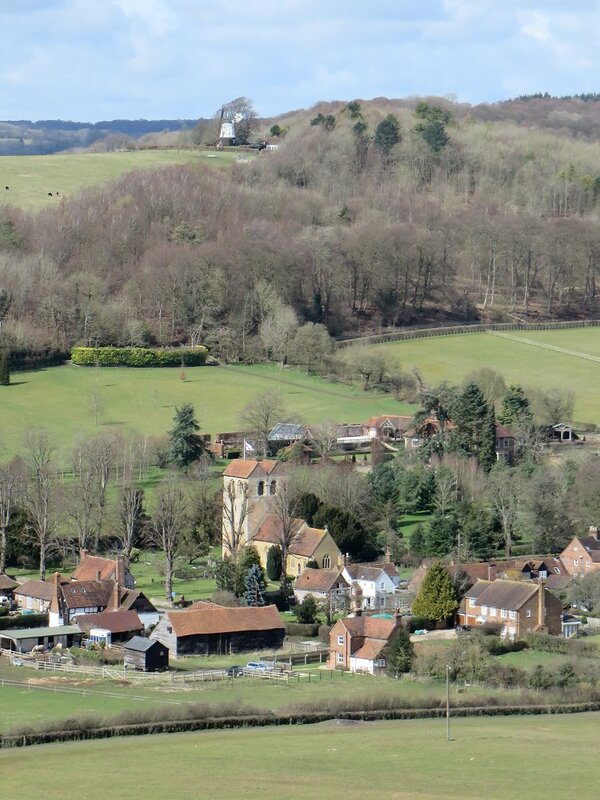 After a brief look around Turville, we headed off on a footpath out of the village, toward Dolesden. Following the road for a short distance, we left via a forestry track through Great Wood, encountering more fallen trees. Stopping to check the map while following Shakespeare's Way. We left the forestry track to join Shakespeare's Way through Gussetts Wood. This long-distance path goes from Stratford-upon-Avon to the Globe Theatre in London. Needless to say, we didn't follow it all the way, although we had walked past the Globe Theatre on a walk we did in London earlier in the year. Following Shakespeare's Way through more woodland, we eventually emerged onto Skirmet Road. It was a matter of following the road for short distance and crossing a field to get back to Hambleden. See our route on Bing Maps. 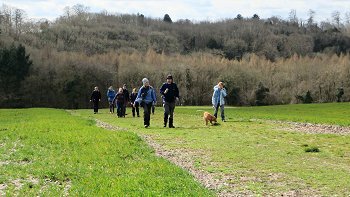 This ten mile walk had included many inclines and a lot of muddy paths, so we had a good work-out on this unexpectedly fine day.